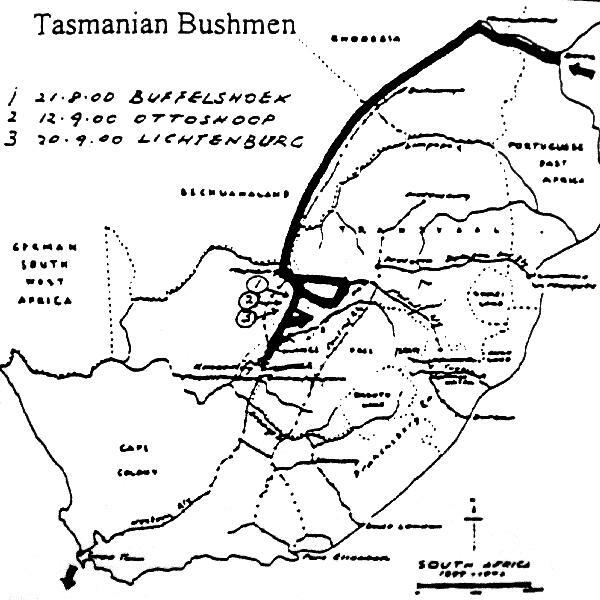 Map illustrating the activities of the 2nd Tasmanian Bushmen in South Africa, 1900. Murray, P. L., Official Records of the Australian Military Contingents to the War in South Africa, p. 551. Lieutenant-Colonel B.T. Wallack, Special Service officer, went in charge; and officers ware posted in South Africa. Pay and equipment were as for former Contingent (see 1st Tasmanian Mounted Infantry), except (in regard to the latter), such slight changes as ware requisite in providing for mounted men. Sergeant A. M. Boyes, promoted Lieutenant 18th November, 1900; Adjutant, 2nd January, 1901. Lieutenants Lowther and Adams were promoted from lst Contingent. 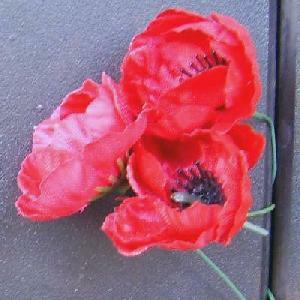 Sergeant G. W. Kemsley became Lieutenant "C" Squadron, Australian Commonwealth Horse. The Contingent embarked at Hobart, 5th March, 1900, comprising - 52 sergeants and real[ and file, 58 horses. One was killed; 2 struck off in South Africa; 1 officer commissioned in the Imperial Army; 1 Officer, 49 others returned. The Bushmen's Contingent, consisting as before stated, of about a half-squadron of Mounted Infantry, was sent to the theatre of war, under charge of Lieut.-Colonel E.T. Wallack. They embarked at Hobart on the transport Antillian on 5th March, 1900; arrived at Cape Town on the 31st, and proceeded thence to Beira, where Captain A. H. Riggall took charge, he being the officer who had previously brought out the draft for the 1st Contingent. Formed part of General Carrington's Column, sharing in the operations in Rhodesia and Western Transvaal reader him. Then under Lord Erroll in Transvaal Mounted Infantry Brigade afterwards, under Lord Methuen, in Western Transvaal, Griqualand, Orange River Colony. Having crossed Rhodesia towards Mafeking, they took part in many operations, under the leaders named. They had several casualties near Ottoshoop in August, when Carrington was endeavouring to assist Colonel Hore. The Contingent formed part of a complete Bushmen's Regiment, with "D" Squadron, 1st New South Wales, one Squadron of New Zealanders, and three of South Australians. For a long time the Regiment did excellent work in the Western Transvaal, as part of Lord Methuen's Force. At Buffel's Hoek (21st August), there was a sharp fight. They were in stunts at Ottoshoop (12th September), and Lichtenburg (28th). About the month of September, Captain Riggall was invalided home, and Lieutenant Lowther took charge. Throughout the latter part of 1900 and the first quarter of 1901, the composite Bushmen's Regiment was in many engagements, chiefly in the Western Transvaal, but also in Northern Orange River Colony. In several of these the enemy fought with considerable determination; and, consequently, losses were frequent. For many months the Western Transvaal was dangerously denuded of troops; thus there was considerable strain on those who ware there. The Contingent embarked on the transport Aberdeen at Cape Town on 19th May, 1901, and arrived in Tasmania on 14th June; having called at Albany, Adelaide, and Melbourne on the way. Disbanded on 16th July, 1901. Murray, P. L., Official Records of the Australian Military Contingents to the War in South Africa, pp. 552 - 553. The Roll of Honour contains the names of all the men known to have served at one time with the 2nd Tasmanian Bushmen and gave their lives in service of Australia, whether as part of the 2nd Tasmanian Bushmen or another unit during the Boer War.